Please email for further details or to order any of these items. Cheques should be made payable to the “Shropshire Ornithological Society”. A book on the birds of Shropshire, incorporating the results of the recent BTO Atlas project, but with an additional two years of additional survey data, will be published in autumn 2019. The Birds of Shropshire will be the most comprehensive record of the County’s avifauna ever published. It is being produced by SOS, and will be based largely on the results of six years fieldwork up until 2013, winter and summer, by over 650 different observers who submitted over 333,400 records. These records have been used to produce maps showing the current distribution of almost 200 different species. The publication will be a full-colour, easily readable hardback book of nearly 600 pages, written by 27 of the County’s most experienced and knowledgeable birders. Stunning images of 220 species have been contributed by 21 local photographers, both amateur and professional. It will include an account for each species, describing its distribution and relative abundance, and the breeding status where relevant. The current breeding and winter maps will be compared with those shown in An Atlas of the Breeding Birds of Shropshire (1992) and with the Shropshire data in the national volume, An Atlas of the Wintering Birds in Britain and Ireland (1986). Historical data, and results of specific local studies, will also be incorporated. It will cover every species on the “Shropshire List” (over 300), so migrant species, county rarities and birds that have not been recorded here since 1950 will also be covered. For many species it will show that massive changes have occurred in their population and distribution. The book will shape conservation priorities in the County for the next 20 years. Forewords have been contributed by Amanda Craig, Area Manager for Natural England, confirming the importance of the research for setting conservation priorities and targeting scarce resources; and by Dawn Balmer, co-ordinator of the acclaimed Bird Atlas 2007-11 for the whole of Britain and Ireland, published recently by the British Trust for Ornithology, putting the local book in its national context. The Birds of Shropshire will be published by Liverpool University Press, a renowned academic imprint. The cover price will be £45, but it will be available at a pre-publication price of £25. Details of this offer will be available later in 2019 from Leo Smith and will also be announced in The Buzzard and on this website. The latest yearly volume currently published is for 2016. The issue for 2017 is in the pipeline and work has begun on species accounts for 2018. SBR is distributed free to SOS members and is available to others at a nominal cost. Some older copies of Shropshire Bird Reports are also available. Please use the contact details given above for further information. Back issues of SBR (from 1955 onwards) are also available at the Historical Ornithology of Shropshire website here. The Buzzard is the magazine of the SOS, published quarterly and supplied free of charge to members. Each issue has an editorial, the latest news items, field trip reports, updates on survey work, sometimes a book review, a guide to local birding locations, as well as details of forthcoming field trips and indoor meetings. Other regular items include pages on the National Trust (Long Mynd), Shropshire Wildlife Trust, BTO Survey News in Shropshire and ‘Bird Notes’, a summary of birds seen in the County in the last quarter. 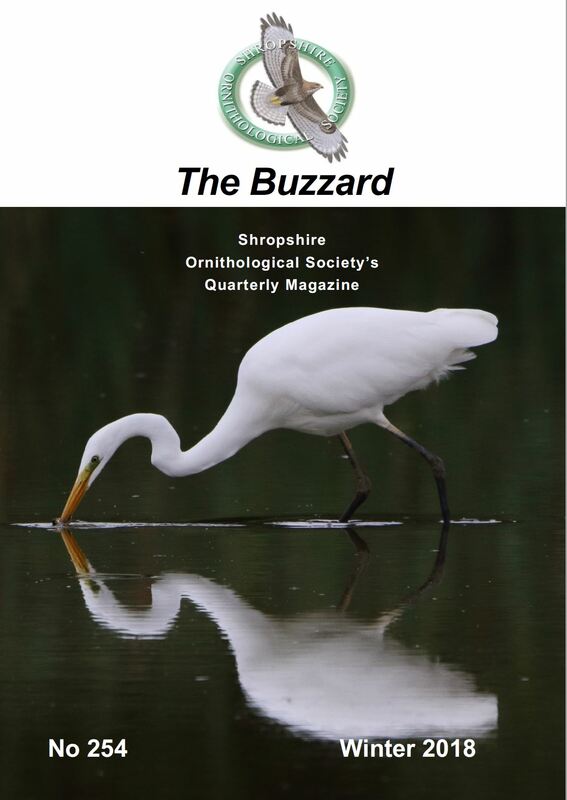 Back issues of The Buzzard from Spring 2014 are available on the Historical Ornithology of Shropshire website here. Members may also elect to receive The Buzzard electronically rather than in printed format. For more information on this option, please select this link . This book was published by the Society in 1992 and is one of the most important nature conservation publications produced in the County. The Atlas was based upon six years of fieldwork between 1985 and 1990 and includes distribution maps for nearly all of the 122 species of bird known to breed in Shropshire. An introductory chapter describes the wide variety of habitats to be found in the county and maps show the association of particular groups of species with each habitat. Each map is accompanied by a commentary by local ornithologists that help to explain the distribution of the bird and how it relates to its chosen habitat. An electronic copy of the 1992 Atlas is available at the Historical Ornithology of Shropshire website here.